SEAFORD, Del. 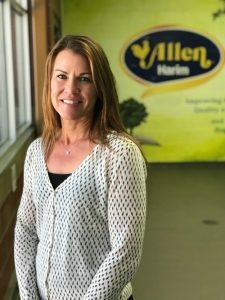 – July 16, 2018 – Allen Harim, a leading producer and processor of No Antibiotic Chicken on Delmarva, has hired Janet Anderson as a Senior Sales Manager handling National Accounts. Anderson has 32 years of experience in the commercial food industry. Over the last 24 years her primary focus was development of the top 500 commercial chain restaurants and helping to improve profit margins at some of the country’s top companies including Michael Foods, ConAgra Foods, and Rembrandt Foods. “Janet’s experience handling National Accounts will allow us to continue our focus on being a leader in the No Antibiotics Ever business segment,” said Kyle Richard, Senior Vice President of Sales and Marketing at Allen Harim. “I am very excited to be a part of the Allen Harim team and look forward to helping the company continue to grow,” she said. Anderson has two daughters. Her oldest will be pursuing a Master’s Degree this fall at the University of Oregon and her youngest will be starting her Junior Year at San Diego State University.